For most visitors to Nevada, the state consists of the lights of Las Vegas or the endlessly long drive down Interstate 80. As such, few people ever see Nevada or know what lay beyond the standard tourist attractions. Yet, for the person interested in exploring beyond the lights of Vegas or the crowds of the Lake Tahoe region, Nevada is full of beautiful, scenic and incredibly remote areas. An intrepid traveler in Nevada will discover snow-capped mountains, vast meadows, sprawling valleys, deep canyons and gorges, Lake Tahoe, and so much more. Best of all, visitors are few too many of the most scenic and unique parts of Nevada. 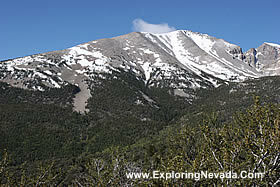 Nevada Scenic Drives : Detailed information, photographs and maps of 24 scenic drives in Nevada. Nevada Photographs : Thousands of photographs showcase the towns, sights and scenic beauty throughout Nevada. Nevada Cities & Towns : Information, maps and photographs about the various cities and towns in Nevada and in the Lake Tahoe Basin. Nevada Books & Maps : Detailed information about the many books that provide information about visiting, recreating and exploring Nevada. Nevada Web Cams : Listings of all the web cams in Nevada and the Lake Tahoe area.